Now Showing: A ‘Mixing in Math’ Webinar! Mixing in Math (“MiM” for short) is a set of over 200 free, easy-to-use, and Common Core-aligned activities that situate math in the context of everyday experience. Aimed at ‘informal educators’ of children in grades preK-6 (including librarians, after-school providers, and parents), MiM activities comprise craft projects, posters, calendars, and games and span the topics of arithmetic, measurement, time, money, and patterns. MiM activities can be incorporated into an array of afterschool and informal settings, including game nights, story-times, or project times and adapted to groups of varying sizes—from 1 to one dozen. The MiM activity catalog has been developed with the input of hundreds of librarians and informal educators across the country. Full of great—and duly, accessible—tools and tips, this webinar helps kids AND the adults who work with them gain confidence and competence in math. If that’s not a compelling enough reason to tune in and give MiM a try—external evaluations found that after using MiM for an average of 1-2 years, 90% of librarians cited math as a “strong priority” in children’s library programming vs. 25% at baseline. AND MiM helped 75% of afterschool educators improve their abilities to engage children in math—with the same percentage reporting that children improved their math skills, enjoyment, and comfort. Looks like MiM got the “mix” of math and fun just right! To learn more about MiM impact, download activities for free, or pick up a training guide, please visit: http://mixinginmath.terc.edu. NCSM and NCTM 2012, Here We Come! Hello, math-educator friends and colleagues! This next week, TERC staff will be attending and presenting at the 2012 NCSM Annual Conference and the 2012 NCTM Annual Conference —two of the largest math education events in the country. Join us in Philadelphia for over 10 staff presentations, Monday, April 23rd-Friday, April 27th on topics ranging from intervention strategies in the elementary classroom to framing the Common Core State Standards within elementary teaching practices to measuring and aligning early algebra learning in the elementary and middle grades. Click to download the official listings document and descriptions! and (5) Leadership to Enhance Mathematics Teaching and Learning for All: Helping administrators and other leaders support high quality mathematics instruction. This year, NCTM (April 25-April 28) will offer over 700 presentations, special strand sessions pertaining to new technologies, and an exhibit hall with vendors, organizations, and—TERC, at exhibit booth #452! Stop by to check out some of our newest math and numeracy publications, informal math research projects, disabilities education tools, and online gaming and new media endeavors for K-adult audiences. Travel safe, and see you next week! TERC’s staff is comprised of researchers, developers, evaluators, mathematicians, scientists, educators, designers and—authors. In addition to the array of deliverables borne of the research endeavors here, the list of STEM-related books by TERC staff is substantive—and downright comprehensive. That said, it might surprise you to learn that a TERC-authored book recently won an award for its cover design. But that’s exactly what happened with Susan Jo Russell’s (TERC), Deborah Schifter’s (EDC), and Virginia Bastable’s (SummerMath for Teachers) Connecting Arithmetic to Algebra, recently published by Heinemann. The book cover below was a Bookbuilders of Boston winner in the ‘Professional Covers’ category and will be featured at the 55th Annual New England Book Show on Wednesday, May 2nd, at Boston’s Symphony Hall. Be sure to check out this great accompanying essay (or click on the image below) by Susan Jo appearing in the Heinemann catalog. She examines one classroom technique for connecting a 2nd grade addition and subtraction lesson to the properties of operations—AND the Common Core State Standards. 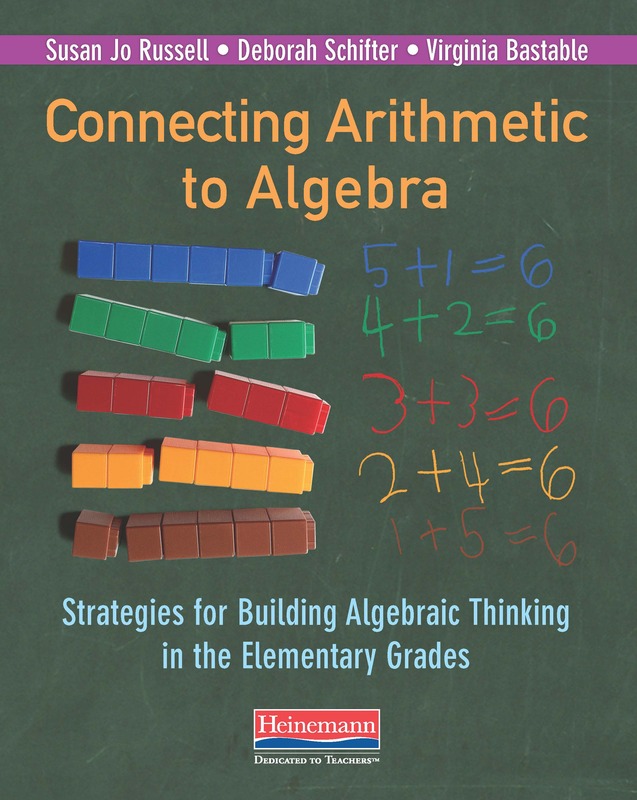 For many more of those helpful classroom examples of connecting arithmetic to algebra in the elementary and middle grades, pick up a copy of Connecting Arithmetic to Algebra at Heinemann.